Approaching two decades of industry prominence, commercial integration firm Anderson Audio Visual recently earned an APEx certification from InfoComm International in May. The association’s highest standard of excellence for audiovisual providers is a diploma of expertise and customer experience attainable by only the finest organizations. We reached out to Anderson’s CEO Shane Parkes to uncover the paths he and his company took to achieve such a distinguished place in the industry, as well as its plans moving forward. Shane Parkes: I am the CEO of Anderson Audio Visual. In this role I am responsible for the overall strategic direction of our company and its five office locations in California and Texas. I work closely with the offices to make sure they have what they need to facilitate growth and maintain the high level of standards our company is known for. SP: I have held this role since 2012, and have been with Anderson since it was formed in 1998. I was CFO prior to becoming CEO. SCN: How did Anderson get its start? SP: My brother and I founded Anderson in 1998 in San Diego, CA. The audiovisual integration market was in its infancy at that time, and we recognized there was significant potential for growth in this sector. Companies were starting to use AV equipment more and more for presentations, and we felt there was a need for a partner they could rely on to help install and maintain their AV equipment. Anderson AV specializes in the corporate market, with installs such as the above at Opus Bank in Los Angeles, CA.SCN: How has the company changed with the times? SP: As we have grown over the years, we have worked hard to preserve the company culture and make sure our employees continue to feel like they have a say in how we operate. We now have more than 170 employees over multiple locations, and we pride ourselves on being a great place to work, as well as a company that is extremely dedicated to its customers. If you spoke to our employees they would tell you that Anderson still feels like a small company even though it now has annual revenues in excess of $50 million. The AV industry has evolved in many ways over the last 18 years. We have always believed that strong customer relationships are the foundation for a successful business. This approach has ensured that no matter what happens in the AV market, we have a strong customer base to continue to sell our products and services to. Of course, this customer base would mean nothing if we didn’t have a staff of loyal and dedicated employees representing Anderson every day. SCN: Which vertical markets does your company serve primarily? SP: Anderson is primarily in the corporate market, plus some government and higher education work. The diversity of the corporate market helps to ensure that our company can continue to perform even if one segment is not particularly strong at any given time. SCN: How has Anderson adjusted its approach to these markets? SP: The corporate market has changed a lot from when we first started out. In those days, the main focus for our business was the executive boardroom environment. This was primarily due to the cost of AV equipment at that time, and that companies could only afford to install the technology in their executive rooms as a result. Over the years, as the cost of equipment has come down, AV has spread throughout organizations, and is now a critical business tool for our customers. They use this technology not only to communicate within their organization but also to communicate with their customers. 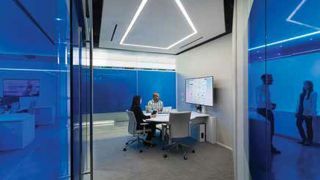 A typical AV installation now encompasses AV technology throughout our customers’ locations, from lobby areas, to huddle rooms, training and meeting rooms, and of course, the boardroom still. SCN: What has the feedback been from end users? SP: I think our customers now look at AV as being integral in how they operate, and I believe the partnership with us as integrator is more important than ever because of this. AV is an essential business tool for them to communicate, and with the introduction of new services in the cloud such as virtual meeting rooms, I see our customers looking to utilize AV technology even more in the future.